And so much has happened and yet, so little – Fiddlesticks! I am an immigrant. I shall always be an immigrant. I walk like an immigrant. I talk like an immigrant. I am an immigrant from my tip to my toe. This word Immigrant, you know how it was born? It emerged from the word Migrate. Migrate. First prescribed as a description of what birds do. And how free are they? I am an immigrant like the birds. Reach of the top of the tree and you get to the first branch. But reach for the stars and you get to the top of the tree. And here are the stars. What if for one moment in one day we reach for the stars? And spread your arms open wide as we spread ours? We reach out to all and beyond and say. Let it be. Let them come. Let it be. Let them come. Let them come with their baklava, their coffee and teas. Like Moses let us lead. Let us all lead. Let them bring their hymns and their prayer beads. Let them wear the saints in gold around their necks. Let them bring their grief and their good, their kismet. Let them bring their stories and their laughter. Speak of Christmas and Ramadan and Hanukkah. Let them ring their church bells, let their muezzin call. Let the cacophony ring true and ring through to us all. Let them throw down their seeds and let freedom flower. The blessed language of the body and the face – the language of us. Than the clumsiness of words. Let them come, I implore. Let them exchange our customs and let it be customary to exchange. Let them come like the beautiful life-giving rain. I shall wear the yarmulke, they shall wear the cloth. I shall wear the talit, let them wear the cross. Let them come in the name of their gods. Let them come. It is you that visited them. You. For whom the sun would never set. Let us decolonise our minds: Live free, yet, never forget. Into the waves catching all and sundry lunging into slaves. It was you who counted the bounty and threw the rest overboard. Ruling the waves indeed by gun by God by sword. These British cities thrive today on the cash flow from then. Then let’s address the current, the strong strong current, then. Let the knots of history come undone. Let your people finish what your people begun. Let us open our arms as they did – Let them come. So many truths in so few words. The time’s come for our voice to be heard. Keep doing what you’re doing. Lemn is author of a series of books of poetry alongside articles, records, broadcasts, public art, commissions and plays. Sissay was the first poet commissioned to write for London Olympics. His Landmark Poems are installed throughout Manchester and London. They can be seen in The Royal Festival Hall and The Olympic Park. His Landmark Poem,Guilt of Cain, was unveiled by Bishop Desmond Tutu in Fen Court near Fenchurch St Station. Sissay’s installation poem what if was exhibited at The Royal Academy alongside Tracey Emin and Antony Gormley. It came from his Disko Bay Expedition to the Arctic alongside Jarvis Cocker, Laurie Anderson, Ryuichi Sakamoto, Leslie Feist and KT Tunstall. His 21st century poem was released on multi-million award winning album Leftism by Leftfield. A violin concerto performed at The BBC by Viktoria Mullova was inspired by Lemn Sissay’s poem Advice For The Living. Sissay’s award winning play Something Dark directed by National Theatre of Wales artistic director John McGrath has been performed throughout the world and his stage adaptation of Benjamin Zephaniah’s Novel Refugee Boy at West Yorkshire Playhouse tours Britain in 2014. A BBC TV documentary, Internal Flight , and a radio documentary, Child of the State, were both broadcast about his life and his Ted Talk has close to a million views. His documentary on the late Gil Scott Heron was the first pubic announcement of Scott-Heron’s comeback album. Sissay describes dawn in one tweet every day. His Morning Tweets. One Morning Tweet became an award winning building MVMNT Café commissioned by Cathedral group designed and built by Supergroup’s Morag Myerscough. It is the only building in the world built below a tweet. Cathedral also commissioned a Landmark Poem, Shipping Good, which will be laid into the streets of Greenwich. He was the first Black Writers Development Worker in the North of England. He created and established Cultureword (part of Commonword) where Sissay developed supported and published many new writers who’ve gone on to a life of creativity. Sissay received an MBE from The Queen for services to literature and an honorary doctorate from University of Huddersfield who run The Sissay Scholarship for care leavers: It is the first of its kind in the UK. The Guardian newspaper heralded the arrival of his first book Tender Fingers In A Clenched Fist. 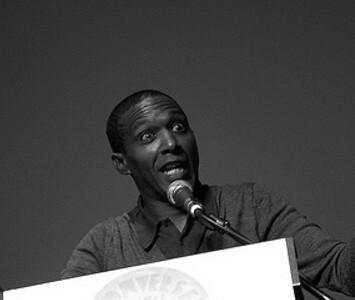 “Lemn Sissay has Success written all over his forehead”. He was 21. Between the ages of 18 and 32 he tracked his family down across the world. His career as a writer happened in spite of his incredible life story not because of it. He has made various BBC radio documentaries on or with writers such as Gil Scott Heron, The last Poets, JB Priestley, Edgar Allan Poe and poetry films broadcast to the nation. His head is in London where he’s based, his heart is in Manchester where he is not, his soul is in Addis and his vibe is in New York where his mother lives. He blogs openly for personal reasons. Google Lemn Sissay and all the hits would be about him. There is only one Lemn Sissay in the world.